4 post lift OR-14 Alignment Derek Weaver Co., Inc.
Forward® Lift's OR14 Open-Front Alignment Lift is the ultimate in quality and support after the sale. Pair with the Alignment system of your choice for a very profitable system that will last and last. 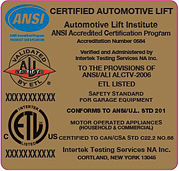 The OR14 is the perfect automotive lift for entry into the profitable alignment business. The OR14 open front alignment lift allows unrestricted access to the front suspension components of most vehicles. The open front reduces the time necessary to perform front wheel alignments. The OR-14 four post lift utilizes the same advanced cable design as the Forward® CR14. In addition it includes the same air operated single point lock release mechanism and internal lock ladders for easy leveling of the alignment lift and 18 level working heights. The OR-14 locking mechanism also has a secondary locking mechanism that automatically engages in the event of a slack cable. For wheels free service the Forward® OR14 Lift includes 2 RRJ70G roller jacks. The addition of the Rolling Jacks allow additional revenue generating service such as brakes and other wheel service. The OR-14 includes anchor bolts, installation manual and is powder coated for a durable finish. The Forward Lift OR14 is backed by a 5 Year Structural Parts Warranty, an 18 Month non-structural parts warranty - power units, cylinders, cables, arms, etc. and a 6 Month Labor Warranty. An optional eighteen month Extended parts warranty may also be available. Maximum 2 Wheel Alignment: 176.25"
Maximum 4 Wheel Alignment: 164.75"
Overall Height: 9' 1 1/16"
The Forward® Lift OR14 is proudly manufatured by Dover Corp.'s Vehicle Service Group (VSG). VSG comprises nine major vehicle lifting and collision repair brands: Rotary® Lift, Chief® Automotive Technologies, Forward® Lift, Direct-Lift®, Hanmecson®, Revolution® Lift, Elektron, Blitz® and nogra®. Based in Madison, Ind., VSG has operations worldwide, including ISO 9001-certified manufacturing centers in the U.S., Europe and Asia.